As many Southern Californians are acutely aware, it has barely rained at all in this part of the state since February 2017. Despite the fact that winter 2016-2017 was fairly wet overall in SoCal (and near-record wet further to the north), the Pacific moisture stream shut off pretty abruptly by March–and the rains have yet to return to now-parched Southern California. In fact, the past ~300 days have been the driest such period on record across most of Southern California–including in Los Angeles proper, where the 0.69 inches of accumulated precipitation over that interval shattered the previous March-December record of 1.24 inches. 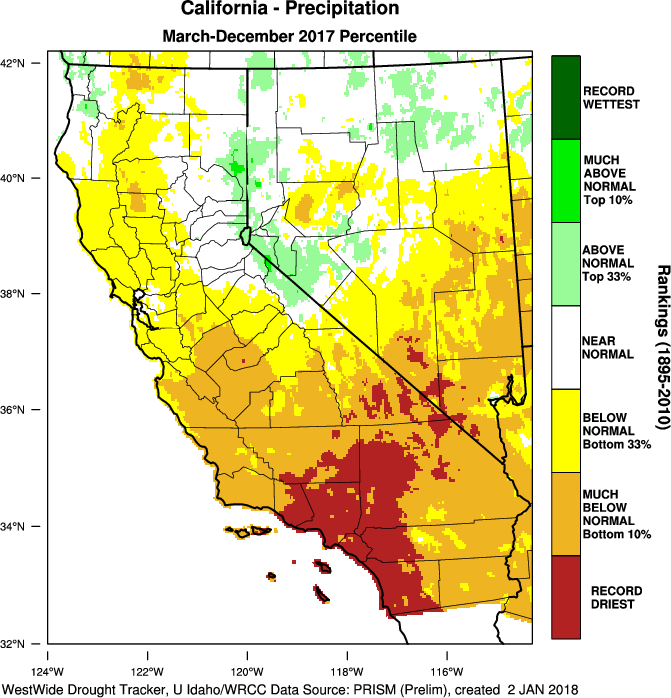 Amidst this record dry spell, widespread (and late-season) record warm conditions have been reported–a combination that helped cause California’s most destructive fire season on record (the Thomas Fire, now California’s largest wildfire in modern history, is still not yet 100% contained as of January 7). As discussed in my last post, the cause of these record dry and warm conditions in SoCal has been the persistence (once again) of an unusually strong ridge of high pressure near the West Coast. Well, I have some good news (for most folks) and some bad news (for anyone living near the numerous recent wildfire burn scars in the state): rain will finally be returning, in fairly dramatic fashion, over the next 24 hours to the entire state. 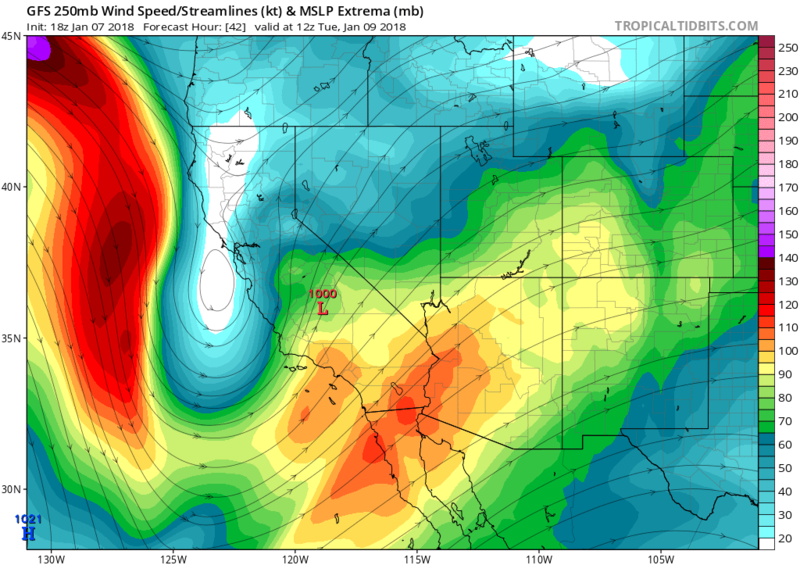 An impressively strong storm system is currently taking shape off the California coast, fueled by a burst of jet stream energy that has finally broken through the persistent West Coast ridge. There had been some uncertainty regarding whether the jet energy would “phase” optimally with a low pressure system, but models have come into unanimous agreement that everything is indeed coming together for a major storm across all of central and southern California over the next 48 hours. The developing storm will share several characteristics of historical systems that have tended to bring significant impacts to all areas, not just the orographically-favored coastal mountains that sometimes “steal” the lion’s share of winter precipitation at the expense of downwind rain-shadowed valleys. The first: this system is developing/strengthening close to the coast, with a sub-1000mb surface low due west of San Francisco by Monday morning. Additionally, this surface low will be associated with a fairly strong, cyclonically-curved jet streak over SoCal–favoring strong upward vertical motion ahead of/along the cold front. 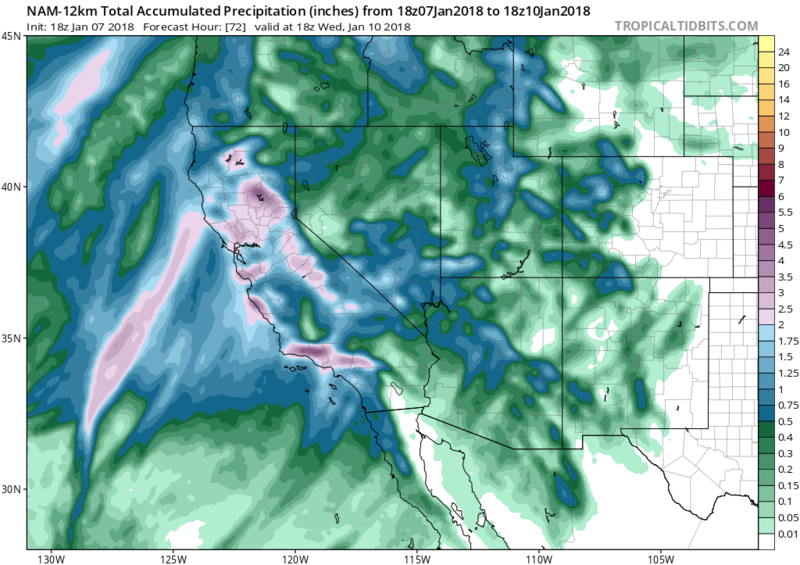 A modest atmospheric river will be associated with this storm system, although it’s actually the storm-scale dynamics that are more impressive than the moisture tap in this instance. Finally, there will be relatively cold air aloft behind the front–creating a convectively unstable atmosphere that will likely be conducive to high rain rates near the front and probably at least a few embedded thunderstorms. There’s even a slight chance of some strong-to-severe cells along the cold front, which could bring locally torrential rainfall in a few locations. 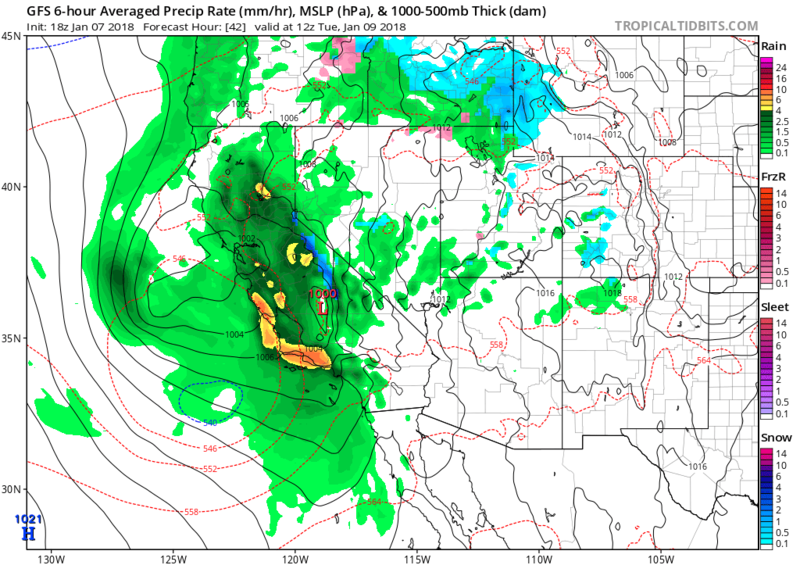 In addition to widespread significant/heavy rainfall, winds could become quite strong and gusty across some coastal areas, especially between San Francisco and Los Angeles. Winds may be strong enough to cause some damage in these areas, though this will probably not be an exceptional wind storm unless the surface low deepens considerably more than expected. Still, this will represent the first major windstorm in many coastal areas in at least a year. Significant mountain snowfall can be expected with this storm, though as has been the trend in recent years snow levels will be relatively high during the bulk of precipitation. Thus, multiple feet of snow will likely fall above 7000-8000 feet but possibly only a few inches below these high elevation regions. While under normal circumstances this storm system would be a largely positive development–bringing much-needed water to parched Southern California–very recent severe wildfire activity will present a high risk of serious, perhaps life-threatening conditions in some places. The region of greatest concern is the region within and near the Thomas Fire burn scar in Ventura and Santa Barbara Counties. The region burned by this wildfire is enormous (around 275,000 acres, or 425 square miles) and extends across vast tracts of wilderness, agricultural lands, and even some urban areas on the margins of Santa Barbara, Ventura, Santa Paula, and Ojai. The confluence of very high burn intensity on the steep slopes above the Ojai Valley, plus a substantial human population in the town of Ojai itself, presents an especially high level of concern. But even areas miles away from the primary burn areas many see significant flood-related impacts from this intense storm event. Why are the risks near wildfire burn scars so much higher than in other areas? In many cases, recent fires in California have burned very intensely and at extremely high temperatures due to record-dry vegetation and ambient weather conditions. In these patches of particularly high burn intensity, nearly all vegetation was consumed by fire–leaving steep slopes completely devoid of soil-anchoring vegetation, and even modifying the underlying soils in a manner that creates a largely impermeable, waxy layer. This means that rainfall has a very hard time soaking into the ground–and is instead forced to immediately flow downhill as nearly instantaneous runoff. When precipitation intensity exceeds a certain threshold (sometimes as low as 0.25 to 0.50 inches per hour, which would normally be well within the capacity of local rivers and streams), rapid flash flooding can result when huge volumes of runoff enter stream channels. Flash flooding is not the only risk, however. Wildfires can also produce vast amounts of ash –which, given high enough rainfall intensity, can accumulate within drainage channels to form an incredibly heavy, debris-laden, wet cement-like slurry known as a debris flow. These flows behave like a hybrid mudslide/flash flood (not unlike a volcanic “lahar”)–and can be incredibly fast-moving and destructive (click here for a visual). More traditional mudslides and/or landslides are also possible, but it’s debris flows that arguably pose the most unique and substantial threat in the wake of wildfires. Due to the particular trajectory of this storm, and the naturally steep topography of the Transverse Ranges, areas near/within the Thomas Fire burn scar will be at very high risk during the period of peak rainfall intensity late Monday night. But other recent wildfire burn regions in California will also be at elevated risk of flash flooding and debris flows during this event–particularly the Tubbs Fire scar in the North Bay. Most other parts of the state not affected by recent wildfires will fare just fine, outside of some localized urban flooding. But make no mistake: if you live near where the Thomas Fire has burned in recent weeks, this is a storm to take very seriously indeed. For Southern California, at least, the Monday-Tuesday storm will be quite strong but equally quick-hitting: the remainder of the next 10 days look quite dry. Things will dry out later this week in NorCal, too, though there may still be occasional light rain across the far north. Out beyond 10 days, there are hints that a more active pattern may re-emerge (especially across the northern part of the state, but perhaps further south as well). At the very least, it does appear that the multi-month streak of seemingly unbreakable Southern California high pressure is over, at least for a little while. Stay tuned!